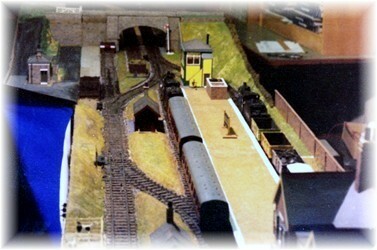 Holloway End was a 7mm scale layout originally built by the late John Jones in the 1970’s. He took advantage of Lima introducing a number of locomotives and rolling stock in a ready to run form in a nominal 7mm scale. The stock lacked detail but was an idea basis for conversion into other more prototypical models. The layout was originally a terminus to fiddle yard arrangement that John designed to fit in his shed in the back garden of his Studley Road home. After competition of the initial layout John offered it to the Club who took it on. Club Members extensively modified the layout into what became a very large and impractical round and round layout. This was exhibited at the Club's 1980 model railway exhibition at Dingleside Middle School. To operate this larger layout Club member Mick Clements modified a number of the LMS 4F tender locomotives Lima had produced into other locomotive types. These included a Southern Railway Q Class tender locomotive and a Southern tank engine. He also modified a number of wagons to make them more realistic. As there was a mixture of both British Railways and London Midland and Scottish Railway liveries on the locomotives all of the freight stock had BR markings on one side and pre-nationalisation markings on the other. As with many of the Club layouts at the time it was not really designed for regular exhibiting and so during the early 1980’s the layout was put into store. The layout did however have a brief swan song in the mid 1980’s when because the Club suddenly found itself with an influx of junior members (including the Club Secretary Guy Craddock). A special junior section was created in the club for them with John Jones taking the lead. Holloway End was used as the group project and it was modified once again back to more or less how John had originally built it! The layout was exhibited at a number of shows after which it was put back into store once construction of Arrowmouth started in 1989. The layout was finally dismantled in 1996 before the club moved out of the Smallwood Alms Houses. Much of the stock and building still exist and are kept in store for potential further use.